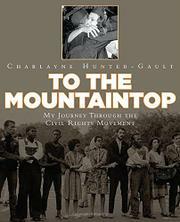 Starting with the inauguration of Barack Obama in 2009 and working back to the early 1960s, Hunter-Gault covers many of the significant moments in the civil rights movement, including her own pivotal role in desegregating the University of Georgia. It was 1961, the year Barack Obama was born, and Hunter-Gault and Hamilton “Hamp” Holmes became the first black students to enroll in the University of Georgia, confronting the racism at the core of the oldest public university in the United Sates. Hunter-Gault places their contribution in the larger context of the civil rights movement from 1960 through 1965, but she has trouble balancing her personal narrative with the many other stories she covers. Given the number of excellent volumes on the subject, this would have been a stronger contribution if Hunter-Gault had focused on her own story; as it is, the book is something of a hodge-podge. Her premise that the civil rights movement was launched in 1960 is questionable, given the many pioneers in the decades prior. Backmatter includes an extensive timeline, articles by other writers on issues of the movement and an extensive bibliography, but there is no mention of any of the excellent works on the subject available for young readers.